The Intersections & Beyond: Get the royal Miss Universe experience with freenet app and win! Get the royal Miss Universe experience with freenet app and win! The Philippines is a country that takes pride in its roster of beauty queens. International beauty pageants are a sport in their own right in this country and are highly anticipated events regarded with the utmost passion from Filipino fans, cheering and supporting each Miss Universe-Philippines candidate both online and offline. The Miss Philippines sash is not a stranger to the spotlight. Amidst the win of 2016 Ms. Universe, Pia Wurtzbach was a full blown controversy after her title was mistakenly awarded to Ms. Colombia. This became a trending topic all over the world, dominated by Filipino netizens who showed their support to the newly crowned Miss Universe Royalty. All eyes, therefore, are now on reigning Miss Universe-Philippines Maxine Medina as she attempts a two-peat win for the Philippines and snag the coveted crown. Even weeks before the pageant, Filipinos are already showing their support online by using the hashtag, #4M4MU. freenet is bringing everyone the royal Miss Universe experience through free access to some of the country’s top pageant sites and even a chance to witness the Miss Universe coronation night LIVE at the SM MOA Arena on January 30, 2017. Starting today until February 12, freenet users will be able to keep up to speed with the latest Miss Universe news and updates in the run-up to the coronation night with free access to top pageant sites such as Missossology, among many others. Smart, Sun, and TNT subscribers can access these exciting and engaging content via freenet without having to worry about data charges. To access all of these exciting perks for free and without data charges, simply download the freenet app on the Google Play Store and the Apple App Store, or visit www.freenet.ph. 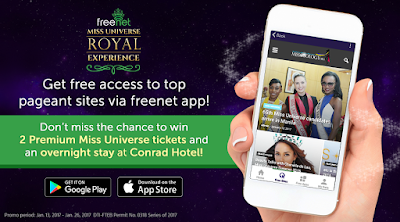 Access the royal Miss Universe experience with freenet, the free and fun way to connect! Per DTI-FTEB Permit No. 0318 Series of 2017.